Oh you poor saps with five-inch thick LCD TVs. Hitachi put them to shame today with its new 1.5-inch “Ultra Thin” line of panels. The secret to that slim figure is in the backlight behind that panel. And that secret, for now, is remaining a secret. On a conference call from Japan today, Hitachi representatives would say only that it uses an “external electrode fluorescent light,” as opposed to the fluorescent tubes behind a regular LCD. What exactly this new term means was left to the imagination. But Hitachi did say that the TV requires a special LCD panel with “a conductive material fused into glass.” So the best guess for now is that the panel creates an electrical field around a container of gas to make it glow—as opposed to having electrodes inside a glass tube. 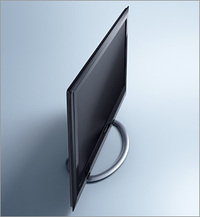 The Ultra Thin TVs will be available in 2008 in screen sizes of 32, 37, and 42 inches. 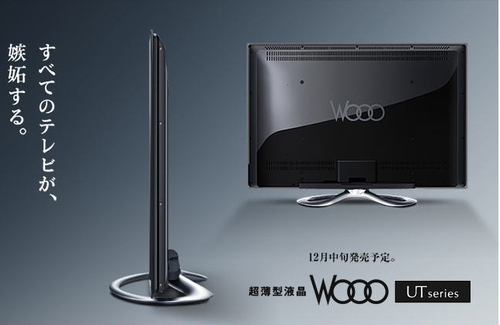 They are not the same as the super-duper ultra thin TVs that Hitachi showed off at CEATEC in Japan earlier this month. Those waifs measure only 0.75 inches and are scheduled to appear in 2009. Hitachi is saying even less about how those sets work, but some industry experts suspect that Hitachi uses light-emitting diodes for the backlight. This will be the next craze for 2008+ Christmas! The great thing will be if they could have these ultra thins as large as 100 inches. Then could be used in museums and art galleries with special kinds of art - a movable dynamic graphic with moving colors and structures. May be psychological healers too! Rich man's eye candy. With the pending recession, Joe and Mary Beercan won't be able to jack some $$$ out of the home equity line and add it to their toy shelf. Could "external electrode" mean the the whole back of the TV is filled with fluorescent gas so that the electrode used to excite the gas molecules would be in the open inside the cabinet as opposed to being inside a tube? Hey, if these get made then maybe all the 5 inchers will get cheap!! 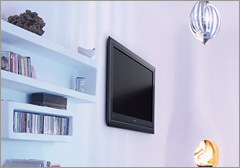 The ultra thin sets are mad with OLED technology (Organic Light Emitting Diode) . Sony was showing their new OLED sets at the CES convention this past January. The specs for an OLED set blow-away anything LCD could ever hope to achieve. Wow, these things keep getting thinner and thinner. I can definitely see these lowering the price point on the 5" models. I would like to see one of these to compare the quality to whats out there now. I love how thin this is. Put it on my list for TVs to get.